The most influential thinker about Jesus was St Paul, and twice St Paul used the person of Adam as a key to explaining who Jesus was and what he brought about by his saving death and resurrection. About 55 AD, writing to the Christian community at Corinth, he wrote, ‘So the first man, Adam, as scripture says, became a living soul; and the last Adam has become a life-giving spirit’ (1 Cor 15:45). ‘(Adam) prefigured the One who was to come … There is no comparison between the free gift and the offence. If death came to many through the offence of one man, how much greater an effect the grace of God has had, coming to so many and so plentifully as a free gift through the one man Jesus Christ’ (Romans 5:14b-15). Writing a few years after St Paul, St Mark the Evangelist gave an enigmatic detail about the death of Jesus: ‘They brought Jesus to the place called Golgotha, which means the place of the skull’ (Mark 15:22). The Vulgate translated ‘place of the skull’ as ‘Calvariæ,’ from which we get the name Calvary. Christian legend and traditions sought to interpret and understand the scriptures and everything to do with the death of Jesus was given great importance. A place name obviously mattered, so what was the significance of Golgotha? The place of the skull? Whose skull? Despite St Jerome’s opinion that this tradition was ‘doubtful,’ it came to be the accepted Christian wisdom: Jesus was crucified in the same place that Adam, or at least the skull of Adam, was buried. This fitted beautifully with the developing ‘Adamic Christology’ which interpreted Jesus as making right through the Redemption all the things that came to pass through Adam and the Fall. In art and preaching the Cross of Christ was paralleled with the Tree of the Knowledge of Good and of Evil from the Garden of Eden. 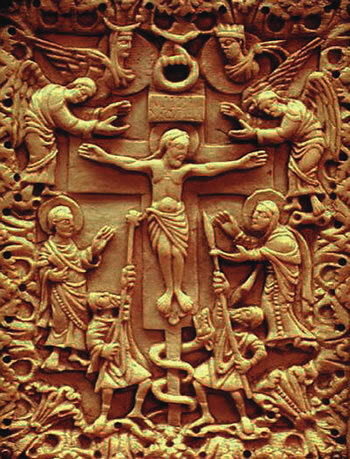 There are ancient images of the crucifixion with a snake present at the foot of the cross. Adam and Eve are tempted by the serpent in the Garden, while at Golgotha Jesus defeats both Death and the Devil. 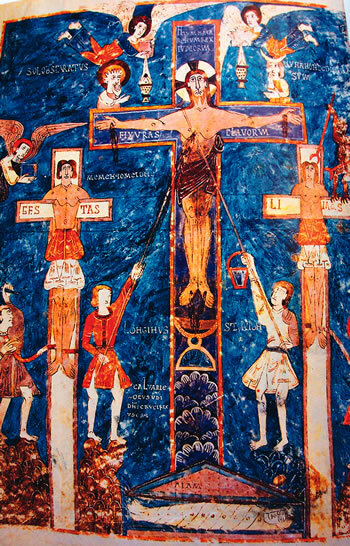 A wonderfully detailed and labelled Crucifixion scene from a Spanish illuminated manuscript of the late 10th Century, now in the Girona Cathedral Archive, has names for all the characters involved in the Crucifixion story, depicts the holy grail collecting the blood of Christ, and the tomb of Adam directly beneath the cross of Christ. 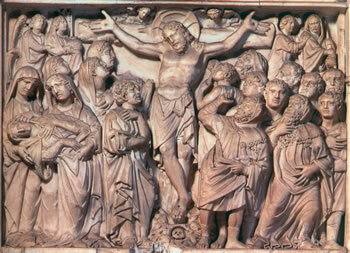 A somewhat anti-Semitic scene carved by Pisano for a baptistery in Pisa, Italy, in about 1260 AD, has the good disciples in a crowd on the left and the unbelieving Jews to the right. Mary is swooning in a very uncomfortable-looking posture. He depicts the grave of Adam and the place of the crucifixion by the skull he has beneath the cross. The skull became an established part of the Russian icon tradition of the crucifixion and on some medieval free-standing crucifixes. Medieval European culture, after repeated incursions of the plague and the consequences of the Hundred Years War, was well acquainted with sudden death, and somewhat obsessed with it. The dancing skeletons of the Danse Macabre and the skulls and bones of Memento Mori shrines were an artistic expression of how quickly one could be snatched from this life. The single skull with a pair of crossed bones became a common feature of crucifixes. It represented the grave of Adam, the name Calvary, and the victory of Christ over death. As a symbol of death, it became the standard symbol for poison. If one were to give up earning an honest living and take up piracy then the Skull and Crossbones was the banner to fight under, representing the antithesis of Christian virtue. 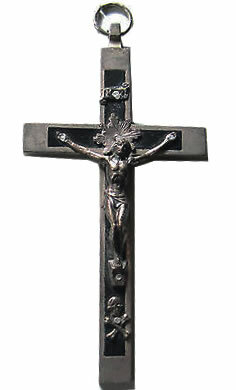 The pectoral crosses worn by religious in the 1950s were most likely their profession crosses. These are an important symbol for a religious congregation, thus not often changed. Hence they may preserve a style of art from the time of the congregation’s founding. As Frank pointed out, it is a style rich in powerful symbolism.